Spanakopita pronounced (spa-nah- KOH -pee-taa), in Greek “σπανάκι + πίτα”, spinach + pie, is a Greek pastry with a filling of spinach, feta cheese (sometimes in combination with anthotyro, which is a soft white cheese similar to ricotta), onions and green onions, eggs, herbs and seasoning. With the same filling we can make Spanakopitakia (spa-nah- koh -pee-TAA-kia), which is the diminutive of spanakopita, which are individual, small spinach pies. However, at the end, I am giving you another different filling so that you have two different choices. The filling is wrapped in layers of phyllo pastry with butter and/or olive oil, either in a large pan from which individual servings are cut, or rolled into individual triangular servings. It can be made with fresh or frozen spinach but frozen spinach reduces the time of preparation considerably but make sure to, defrost in the fridge before using, preferably from the previous day. It is mostly eaten as a snack in Greece, and it can be an alternative to tyropita. You can make your own dough for pies and make your own homemade phyllo (see step by step instructions How to make phyllo, using a dowel) and also see How I make phyllo on the Pasta Maker and a recipe for Spanakopita Strifti (twisted). Wash the spinach, removing the stems or any damaged leaves and drain. Sprinkle with salt and after half an hour squeeze it with your hands to remove all liquid. Alternatively, when still wet you can put them in a big saucepan, without any additional water, and bring to a soft boil for about 5 minutes, until it wilts. It will become soft and its volume will be reduced. Place it in a colander to cool and when it can be handled, drain any water by squeezing it and then cut it into smaller pieces. Place the spinach in a large bowl and add ¼ cup of the olive oil, the onions and herbs, as well as the eggs, feta, herbs and spices and mix well. Grease a 32 x 23 x 6 cm / 12.5 x 9 x 2.5 inches – baking tin (preferably a shallow one) with olive oil. The remaining olive oil will be used to brush the phyllos. Brush each phyllo with olive oil placing it on your baking tin with part of phyllo overhanging on all sides. Continue with 3/4 of the phyllo sheets, brushing them again with olive oil. Fold the remaining phyllos in the middle and continue adding them on top, oiling each phyllo. Tuck the edges to the side of the baking pan with your hands or using the top of your brush. With a very sharp knife, cut through the top layers of phyllo, taking care to not cut through the filling, into diamond or square pieces. Wet your hands and sprinkle some water on top of the phyllo. Repeat once more. Lower temperature to 160o C / 320oF and bake for about 45 minutes or until the top is crisp and golden. Remove from the oven and let cool for a few minutes before cutting all the way through to the bottom. Note: Village phyllo is thick and comes in a package with two sheets. One is inserted as the bottom layer and the other on top. This phyllo is soft, so whatever comes out of the baking tin is cut and twisted the join the two phyllos together. 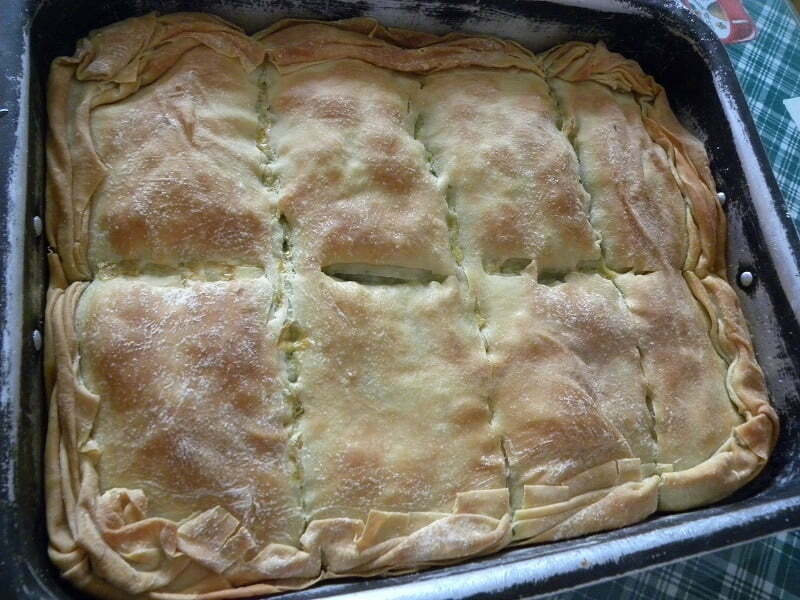 Spanakopitakia with phyllo pastry are usually made into triangles whereas those with homemade phyllo are made into turnovers, coils or bourekia. If using frozen spinach, thaw and squeeze out all liquid. If using fresh spinach, blanch it for 2 minutes with other greens just to wilt and drain. Allow to cool and squeeze out all the liquid. Cut the spinach and other greens into smaller pieces. Heat the olive oil and sauté the red onion, leek and green onion, until translucent. Add the spinach as well as any other greens as well as the green part of the spring onions, finely chopped and sauté for a few minutes. Remove from the heat and allow to cool. Add the dill, the parsley, the cheese (anthotyros) and the egg, salt and pepper and mix. Cut the long side of the phyllo into 2 inches wide stripes and place a spoonful of filling. Cover the spinach forming a triangle to the left. Then continue folding going front, then right and then left, repeating until all the phyllo is folded. Heat the olive oil and fry until golden on both sides. Remove on kitchen paper to absorb excess oil. Note: If you want to bake them, as I did, brush each stripe of phyllo with clarified butter (or olive oil) and then add the filling and fold as above. Line your baking tin with parchment paper and bake in a preheated oven to 180oC for about 35 – 40 minutes or until golden on top. Spanakopita (Greek "σπανάκι + πίτα", spinach + pie) is a Greek pastry with a filling of spinach, feta cheese (sometimes in combination with anthotyro, which is a soft white cheese similar to ricotta, onions or green onions, eggs, herbs and seasoning. Grease a 32 x 23 x 6 cm / 12.5 x 9 x 2.5 inches - baking tin (preferably a shallow one) with olive oil. The remaining olive oil will be used to brush the phyllos.